Ace Diamond & Jewelry Brokers is an estate jeweler. Estate jewelry is any jewelry that is pre-owned, and it can be from an earlier period or contemporary. Almost every gem will at some point become an estate item. For example, once an item has been gifted, donated, handed-down, traded-in or re-sold, it becomes an "estate" piece. Many retail jewelers accept an occasional trade-in and purchase some jewelry over-the-counter, but Ace Diamond specializes in estate jewelry. Ace Diamond is licensed by the State of Ohio to buy and loan money on jewelry and coins, and has completed thousands of private transactions totaling millions of dollars. Ace Diamond wholesales to qualified jewelers and coin dealers. Retail sales are done on a very limited basis - mostly to certain established clients and to a select few who are referred, by appointment. Additionally, expert diamond setting and jewelry repairs, including ring sizing, chain soldering, platinum repairs, watch battery replacement and laser welding are done on the premises. Enjoy your visit, and please feel free to contact us if you have items to sell or pledge, or need jewelry repairs or laser welding services. - Ace Diamond & Jewelry Brokers, Inc.
7110 Market Street, Boardman, OH 44512. Phone (330) 629-6363. 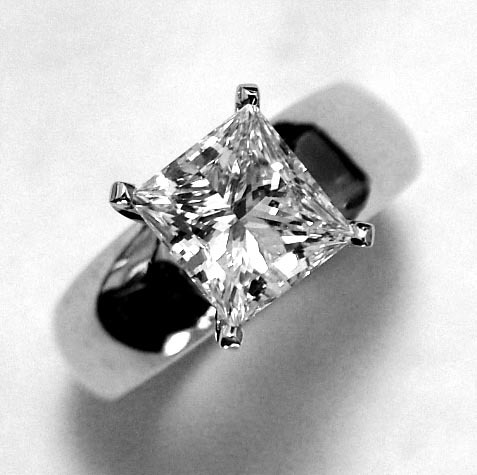 Engagement Ring featuring a stunning 2.49-CT princess-cut diamond (H/VS-2, GIA Report), in platinum. 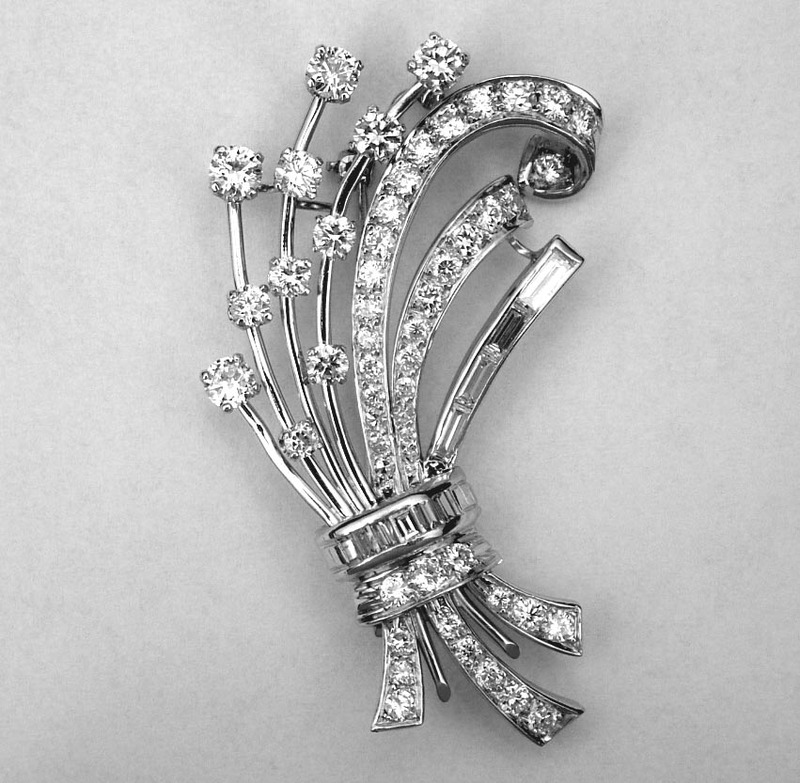 Pendant-Pin, 3-CTs TW round & baguette diamonds in shimmering white gold scrolls & ribbons, c.1950s. Rated #1 by the Jewelers Board of Trade! Welcome to Ace Diamond & Jewelry Brokers!